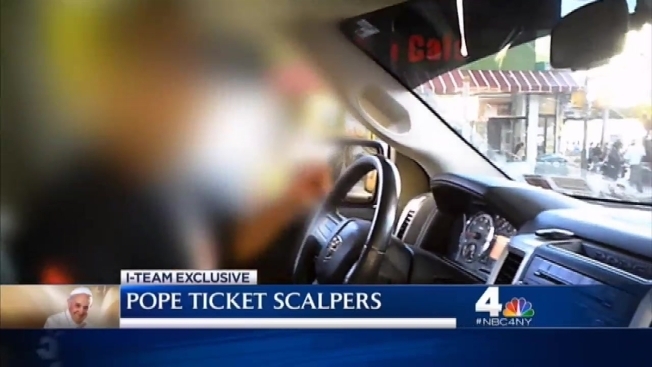 Despite religious and political leaders condemning the resale of tickets to papal events, the I-Team found New York City scalpers who say they are doing nothing wrong by charging hundreds of dollars for tickets that are meant to be free. "This is a tangible object. I own it," said a Queens scalper holding up a ticket to see Pope Francis tour Central Park on Friday. The I-Team caught him on hidden camera offering to sell that ticket, plus a second, for $150. "The city gave it to me. If somebody else wants it and I can redeem money for it, there ain't nothing wrong with that my man," he said. New York City handed out about 80,000 free tickets to the pope's Central Park event through an online lottery. The I-Team found another scalper in midtown offering a pair of tickets to the pope's Central Park tour for $400. On hidden camera, she laughed when asked if she is profiting off the Pope's message. "I'm profiting off of winning," she said, referring to her success in the online ticket lottery. On Craigslist, one seller says he is hawking them because their family can't make it and they couldn't find any friends who would go. Another claims that he is selling his tickets to see the pontiff near Columbus Circle because his girlfriend's birthday is coming up and he wants to use the proceeds to give her a wonderful day. "These tickets come at a perfect time and feel like a real blessing," the ad reads. Dozens of others, some with or without explanations appear alongside tickets to sports games, Broadway shows and an upcoming Ariana Grande concert. One even offered rosary beads for $175 -- complete with tickets to a papal event. Some people listing papal tickets were more charitable, giving them away because they didn't want them to go to waste. One asked for a one-page essay to help decide who should get the tickets. Church and civic leaders denounced the sales and asked websites to remove the listings. The auction site eBay has complied, saying the sales violated its terms of service. Posts have continued to appear on Craigslist. The website did not respond to a message Wednesday. Scalpers started turning them for profit almost immediately, prompting an angry response from one Craigslist user who said they had ruined a "once in a lifetime chance" to see Pope Francis. Last week, Mayor de Blasio blasted those who look to commercialize Pope Francis' by putting a price tag on the tickets. "It's disgusting that anyone would take a free ticket to see His Holiness and decide to resell it," de Blasio said. "No one should buy such a ticket. It's just absolutely inconsistent with everything that this pope stands for." Cardinal Timothy Dolan and Sen. Charles Schumer are among several others who've criticized the notion of profiting off of papal event tickets. Some lawmakers have proposed making it illegal to scalp tickets to nonprofit concerts and free events but currently the practice is legal. But scalpers can still find other online marketplaces. After she was confronted by the I-Team, the midtown ticket scalper said she'd just find another buyer. The Queens scalper said he would scrap his plan to cash in on the pope's visit, but he's not considering giving the tickets away. "I'm going to throw them away," he said.